Download trial version of Pavtube Blu-Ray Ripper and install the application. Connect a BD drive with you PC and insert the Blu-ray disc you want to rip. Double-click the icon to run Pavtube Blu-ray Ripper. Step 1. Load the Blu-ray disc. Click on the “BD/DVD” button to import Blu-ray movie from the Blu-ray Disc drive, or “BD/DVD Folder” to import Blu-ray movie folder from PC hard drive, “IFO/ISO” to convert Blu-ray ISO file. Keep computer networked when loading Blu-ray movie from protected Blu-ray Disc to insure the protections be cracked properly. When a Blu-ray Disc/folder/ISO is loaded, the directory is displayed in tree form. What you need is the main movie---the one with longest duration. So expand the movie directory and check the main movie only. You can rename the output file by clicking on the file name in Destination File column. Right below the file list you could find "Subtitle" and "Audio" droplist, where you can set output subtitles and dubbings to the languages you like. 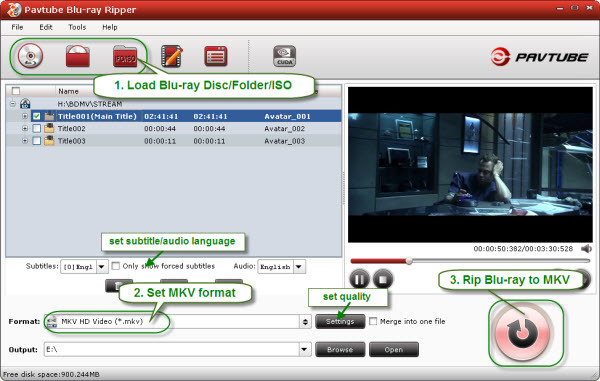 Note 1: Pavtube Blu-ray Ripper lets you keep one audio and subtitle stream only, for ripping Blu-ray to MKV format with multiple audio tracks and subtitles preserved you need ByteCopy instead. Click on Format bar and set MKV format for Blu-ray ripping. In order to rip Blu-ray to MKV 1080p HD video with best quality, you’re advised to select “HD Video” >> “MKV HD Video” format. If you would like to custom resolution, bitrate, file size, audio channels, frame rate etc, click “Settings” button to open Profile Settings panel, from where you can set audio and video parameters to fit your needs. Click “OK” to save your settings. 1. Set 1280x720 from drop-down list of video Bitrate if you’d like to rip Blu-ray to MKV 720p. By default it exports MKV in 1080p Full HD. 2. Set 2000-4000kpbs if you’re ripping Blu-ray to MKV for playback on an Android tablet or smartphone; 4000- 6000kbps for ripping Blu-ray to MKV for viewing on PC or HDTV. When bitrate is set to 8000kbps or above, visual difference is not even distinguishable. 3. Set ac3 from drop-down list of audio Codec if you’d like to get Dolby digital audio for MKV rip. 4. Set 5.1 from drop-down list of audio Channels to rip Blu-ray to MKV with multi-channel surround sound. Step 3. Start converting/ripping Blu-ray to MKV. Click on the “Convert” button and the program will rip Blu-ray movie to MKV format for you. Gear up conversion speed by activating CUDA computing feature with one click on “CUDA” button when/if your computer is equipped with an Nvidia’s graphics card. You could set auto shutdown in progress window (it pops up once you click Convert) or leave it there and come back later (the ripper will tell you how long it takes). 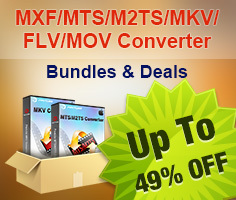 Enjoy the converted MKV videos! 1. To eliminate the interlacing lines, you can perform "Deinterlacing" feature under "Edit"->"Effect". 2. You can also use Blu-Ray Video Converter Ultimate to rip blu-ray movie to MKV format. 3. If you have problems when playing back MKV files on your PCs or with your HD Media Player, you can visit MKV Playback Page to learn more available MKV playback solutions.